Annual. 60 days to harvest. (Kivumbasi ndimu) Native to the island of Unguja, in Zanzibar. Diminutive, growing to 1 foot, flowers white, fragrance distinctly citrusy. Traditional usage (African herbalism): tea, divination. 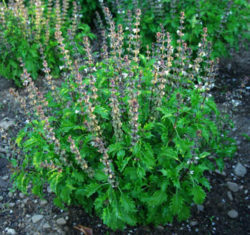 Plant prefers full sun and garden soil. 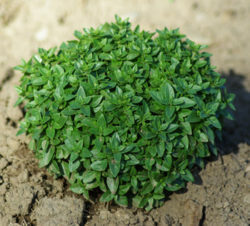 Regular basil culture, sow in the garden in a fine seedbed, or start in pots and transplant. Will tend to go fast to flower, keep nipped back. I first experienced this basil early one morning out behind the “Supaduka” near the town of Paje on the east coast of the main island. I was picking castor seeds to use as a medicine in an herbal surgery I would be performing later on that day–removing plantar warts from the feet of local villagers–when I smelled a delightful citrusy fragrance. I looked around to see if perhaps there was a lime tree nearby, then looked down at my feet and saw that I was standing in a patch of “kivumbasi.” But this was a basil different from anything I’d experienced before, as it had the appearance of the standard small form African Basil but it had the smell of keffir lime. In the tropics its pretty easy to get seed accessions, because for the most part seeds are being produced by plants on an ongoing basis, and this situation was no different. Having finished extracting enough castor seeds for my needs, I then turned my attention to this new basil. I didn’t have a bag with me, so in true African fashion wrapped the dry seedheads in a bit of newspaper. Later, back at the seedhouse in Oregon, I unwrapped the paper and found the seed to be in perfect condition. We spring planted the seed, and the resulting basils were much as I remembered from Paje–very small and intensely citrus flavored. 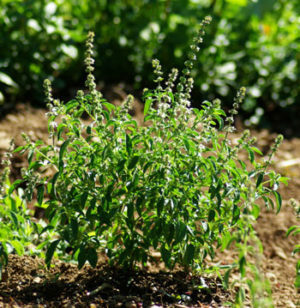 It occurred to me that basil lovers would love this basil, so we planted the plants to our field in a nice patch and managed to grow them out and collect a good amount of the seed (therefore this organic seed offering of a heretofore unknown to the West basil type). How is it typically used? Medicinal or culinary? Medicinal and culinary, a lovely citrusy annual from the island of Zanzibar in East Africa, where many of our basils originated. I live in south florida, and although I can get it growing all the way through to seed, it always seems to be struggling a bit. Could you share any experience on how to help this plant thrive? My other basil specimens typically do very well, but this is my favorite culinary herb and I want to make it happy. You might try direct-seeding instead of sowing in pots and transplanting. 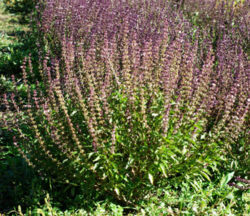 This is a wild-derived basil that likes to grow in place.